Chris Davis has been the talk of baseball for an unfortunate streak but it was Khris Davis who stole the spotlight in the Oakland Athletics' 10-3 win against the Baltimore Orioles. 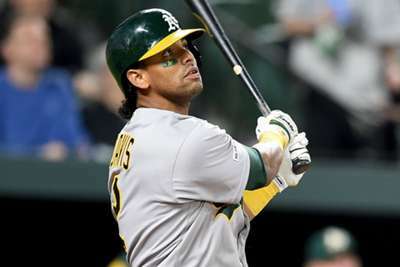 Athletics outfielder Khris Davis had his 17th multi-home run game since 2016 against the Orioles on Wednesday. First, he tallied an RBI in the third to give Oakland a 3-0 lead and then followed with a two-run homer in the fifth midweek. He homered again in the seventh as the A's triumphed to move to .500 (8-8) in the MLB. Back to Chris Davis. He set a major league record with 49 consecutive at-bats without a hit with an 0-for-five performance earlier in the week. The embattled Orioles star was left out of the line-up for a second straight day on Wednesday but came into the game to pinch-hit in the ninth to try and get back on track. That did not happen. Davis pushed his streak to 57 successive plate appearances without a hit, tying an MLB record set by the Cleveland Indians' Tony Bernazard in 1984. Whit Merrifield continued his success at the plate against the Seattle Mariners. The Kansas City Royals infielder extended his hitting streak to 31 games, the longest streak in franchise history. However, the in-form Mariners won 6-5. Jose Altuve hit two home runs in the Houston Astros' 8-6 win over the New York Yankees. Mitch Haniger's homer barely cleared the right-field fence in the ninth to give Seattle a 6-5 lead. It also extended the team's season-opening home-run streak to 14 consecutive games, which ties the record set by the Indians in 2002. Chicago White Sox starter Reynaldo Lopez had a forgettable outing against the Tampa Bay Rays. The pitcher was charged with the loss in the 9-1 rout after allowing eight runs and 10 hits in 4.3 innings. The Philadelphia Phillies put up just three hits against the Washington Nationals. Jean Segura had the worst night at the plate, going 0 for four. Three other batters went 0 for three as the Phillies were humbled 15-1. You do not want to miss this one. Jose Peraza stretched and scooped as Starlin Castro grounded into the double play. The Cincinnati Reds went on to win 2-1 against the Miami Marlins. Cleveland and Detroit will play a rubber match on Thursday. The Indians won the first game, 8-2, and the Tigers answered with a 4-1 victory one day later. Shane Bieber (0-0, 3.38) will start for Cleveland and Spencer Turnbull (0-1, 4.09) will take the mound for Detroit. 00:26 NFL Draft 2019: Should Cardinals take Murray or stick with Rosen?